This May Morning in the Garden! We have been busy as honeybees inside and outside now that spring has arrived. Weekends are when I do most of the gardening so today will see me out there until dusk! 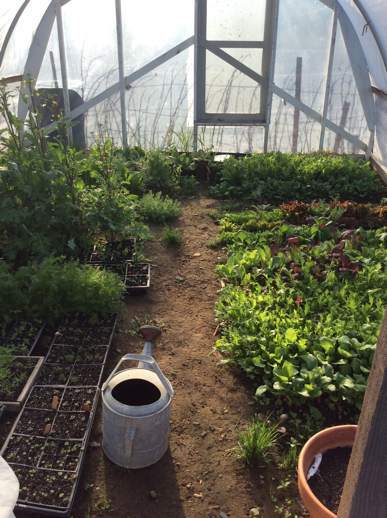 Before I trot off with my trowel and wheelbarrow, I want to give a shout out to our hoop house which has transformed my gardening life. As I have often noted here before, there is a farm down the road where if they need to move four rocks they purchase a backhoe, front loader and dump truck whereas up here on the hill we have tools from the ice age. Move that 20′ diameter pile of compost? Lets do it with our hands! So the hoop house is a marvelous and out of character upgrade. Thank you Angels and Elementals for finding us people who wanted to give use their hoop house, and thank you Alix and Martha! In BHH years (as in before hoop house years) I would move all the tropical plants in the greenhouse into our kitchen so I could use their greenhouse home for seed flats. It was a horrible thing to do to the tropical plants. Just when they were getting the light and warmth they craved, I would move them to circumstances of considerable less light. This year we are still germinating the seed flat in the long hallway that connects the farmhouse to the office building. However, once the baby plants have a few of their true leaves, they are whipped down to the hoop house where I tenderly cover them with frost cloth at night like a mama tucking in a baby. They have been gloriously happy as have the Bermuda babies who haven’t lost their place in the sun. I just ran down to the hoop house to take this photo. Note the Peter Rabbit type watering can. As a stone age old fashioned classic gardener, I encourage you to snap up any old galvanized tin watering cans you find at tag sales. I found this one last year at a friend’s tag sale. It had a leak which was easily fixed with a piece of duct tape. Now it is my garden love object, going everywhere with me. It is better balanced and easier to pour from than all the plastic watering cans I have always used. I hope some intrepid manufacturer brings these cans back! 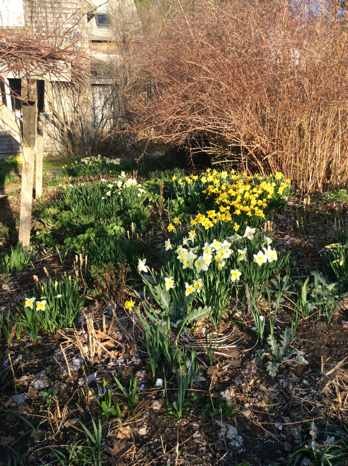 The Daffodils are really coming into their own in the Arbor Garden. What would spring be without these friends? Today I will continue with planting one of the main vegetable gardens. I have lots of baby brassicas hardening off in one of the cold frames, and the Angels tell me that these can go in the ground. This suggests that we have gone from full tilt winter to full on late spring because a hard frost would damage these baby cabbages, brussel sprouts and broccoli. If they tell me to plant, it must mean we are not going to have a hard frost until next fall. It is wonderful exciting to image we really are done with winter ( for now). I also have so much weeding to do everywhere. I love weeding! So many lovely things to savor between satisfying battles with crab grass! 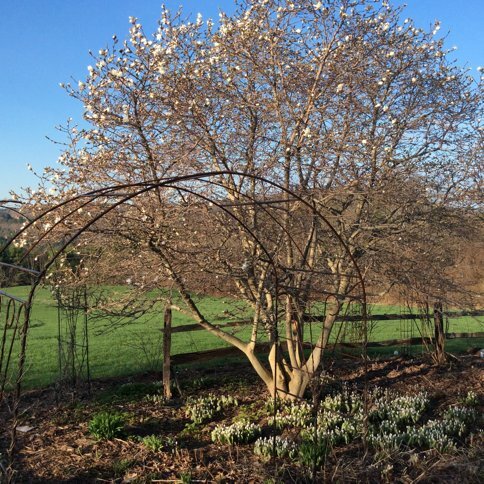 Here the Magnolia is just beginning to open and when the sun reaches them, the Bloodroot beneath will also open in a sort of light filled shadow beneath the tree!